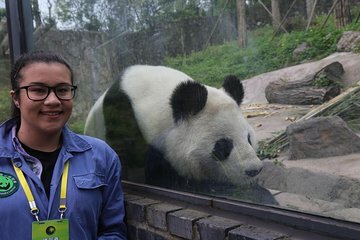 Chengdu mest berømte beboere er ikke mennesker, de er pandas. Med denne private tour kan du nyde en tilpasset dag, der interagerer med disse sort / hvide bjørne ved Chengdu Research Base of Giant Panda Breeding. Design din egen oplevelse med muligheder for at hjælpe en panda keeper i deres daglige opgaver, tag et billede mens du holder en baby panda eller bare observere røde og store pandas i deres kabinetter. What a fantastic day! It was a long drive to the centre but the scenery on the drive was interesting. We then worked hard scooping up poop and bamboo (glad it was winter so the smell wasn't bad!) We also got to make panda cakes and feed a panda. It was the highlight of our China trip. Going to see the pandas in China and actually holding one was a dream come true. My tour guides were amazing. They were on time, accommodating, and knowledgeable about the pandas and the Dujiangyan base center. The ancient city tour was also a highlight of my trip. I would definitely recommend this package to my friends. My family had a great time on this tour! We held and feed the pandas, which was an incredible experience! Our guide for the day was Jay and he was extremely knowledgeable and accommodating with everything we wanted. He knew all of the pandas by name, how old they were, how they behave etc. We also learned a lot from him about the region, culture, and life in China throughout the day. During the tour we asked if we could try hot pot for lunch since that is very popular in Sichuan, so Jay took us to a great restaurant, helped us order, and we had a great time trying food that we otherwise wouldn't have ordered! Before heading to the airport we asked to visit one of the temples in town which was a great way to end the day. Overall it was one of the best days we had during our entire trip. It was an amazing experience!! That day Dujiangyan was expecting a lot of visitors, so we went to Wolong center instead. The opportunity to interact and touch such a rare animal is awesome. I did the photo and feeding option and was done around lunch time. My guide was Sean, and I would highly recommend him. Good English, clean car, prompt pic-up, knows a lot about pandas. We had lunch after panda visit in the nearby town, the weather was great, and the drive to to Wolong goes through tunnels, mountains- very scenic! Went with my daughter. We both did the feeding and she did the holding. She really enjoyed hugging a panda. The feeding/cleaning is definitely worth the money. Same with the hugging - when else in your life will you get to hug a panda. This was one of the most amazing experiences! Our tour guide was so wonderful and knowledgeable. You could tell that he really loved the pandas and cared about them. 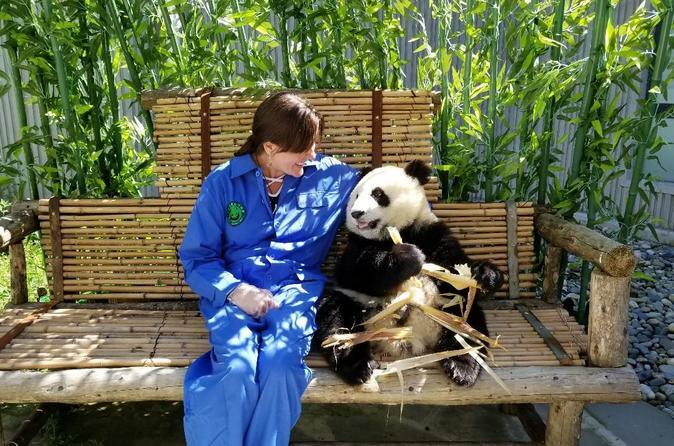 The Dujiangyan Panda Center is a true rescue and rehab facility--not a tourist center. Our time with the panda was very short, which was a little disappointing, but it was very memorable. We also loved spending time watching the other older pandas who were getting ready to be released back into the wild. Our guide knew each one's name and had info on their personalities and habits. After spending time with the pandas we had the most amazing meal at a small, off the beaten path restaurant. It was one of the best meals of the trip! Then we went to an ancient village and spent some time walking around, eating steamed buns and shopping. It was an incredible day! This was so good from start to finish we had the best time, air condition car to panda centre taking about 2 hours when we arrived we had a look around the panda houses they where out and eating spent a good few hours just looking at these wonderful animals, we then went to office where we were given boiler suits to put on you only get a very small amount of time with the pandas but the staff were very helpful they took lots of photos on my phone, as well as both of us taking some with a camera. can not rate this highly enough we had the best time. The tour was great. Jay and Lareina were punctual, courteous and caring. Panda holding was awesome. The ancient town was charming. Overall, this is amazing experience. The best tour we had in China! Daisy and Yay are great, very knowledgable and courteous. They were on time and confirmed the booking prior to arrival. The vehicle is spacious and air-conditioned, very comfortable ride. Panda holding experience although very quick was amazing! Daisy spend the afternoon with us showing around Chendgu, very enjoyable! We also on the advice of the tour guides went to try the famous Hot Pot in Chengdu which was very much enjoyed. I recommend this tour to everyone 100! daisy, we will be back to the lovely Sichuan province!